It's time for our SIXTH ANNUAL Summer Movie Wager! Sarah C. of Geraldo Triviera won our first go around with 49 points in 2013, Patrick D. of The Bastards was our second Wager winner with 56 points! In 2015, special guest Alex B. at cinefilesreviews.com, who can also be found on twitter at @TheAlexBrannan, joined us and won it all with 51 points! Stephane de S. who joined us for a night of Trivia Club at Cardinal Rule, went on to win by less then half a million dollars, and ended up with 60 points in 2016! Finally in 2017, that man that lost by half a million the year before, James C. of The Unusual Suspects won with 58 points! Now as it's even noted in the rules, we usually start the first Friday of May BUT... Summer movie season is not what it used to be! Thanks to Disney deciding to shake things up, and honestly we can't leave the latest Avengers movie off the table, we'll begin the Summer Movie Wager on the last week of April, April 27th and include all other films and box office until September 3rd of 2018, Labour Day Weekend (we've still gotta stop somewhere)! For a schedule of all the films coming out, we recommend looking at Box Office Mojo for an up-to-date list if you want to play at home! For an up to date TOP TEN throughout the Summer, our source will also be Box Office Mojo! For an always entertaining Summer Movie listen and competition we recommend NPR's Pop Culture Happy Hour, as well as the fine folks at The Playlist for an always informative Summer Movie write-up for movies both inside and outside the Blockbuster sphere of influence. 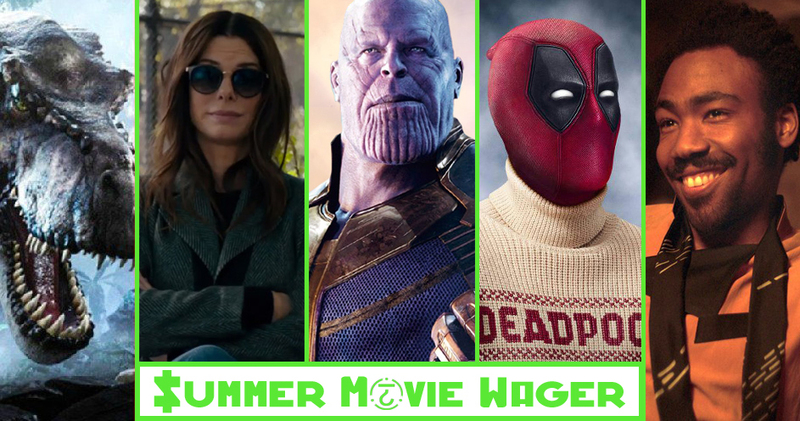 If we have a tie this is how the Summer Movie Wager tie-breaker works: 1) getting 1 and/or 10 correct, 2) the number of dead-on picks from 2 thru 10, 3) the number of picks only one spot away, 4) the number of picks only two spots away, 5) most correct picks including Dark Horses, and 6) box office of highest pick not in the summer’s top 10! If after this, everything is still tied, then the winner’s trophy will be shared!